This Marriage Contract was made for a non-Jewish couple which has strong ties to the Old Testament and tradition. 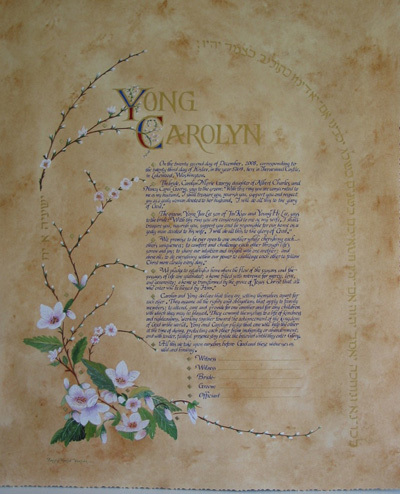 The text which was provided by the couple is written in blue and complements the shades of blue in the Magnolias and the light pink in the Apple Blossom. The artwork is done on the dark background to create a nice contrast to the light colour flowers. The names of the Bride and Groom are illuminated with red and blue which are common in the old manuscripts.